New Westminster Gutter Cleaning is an extremely important part of residential and Strata maintenance, there’s no doubt about that! 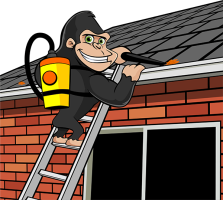 Why not let our Gorilla Gutter Cleaning Team help? Our ultimate goal is free flowing rain water through the gutters and downspouts of all the New Westminster properties serviced by us. As with most areas, Gorilla Property Services recommends a thorough New Westminster Gutter Cleaning 2-4 times a year. Of course, the frequency depends on your part of the city. For example, if you live in the heavily treed Queen’s Park area, we would recommend no less than a twice yearly gutter cleaning. These would be carried out in the Spring and Fall. Anything less and you are risking blockage and leakage causing build-up. This can lead to permanent water damage to the building envelope which is much more expensive to repair than the cost of a regular gutter cleaning service. Our New Westminster Gutter Cleaning Service follows our efficient 6 step program, ensuring complete customer satisfaction. It starts with safety and ends with a full test of the entire gutter system. One of the key elements is clearing out, and in some cases replacing, all of the downspout strainers. This is critical in allowing rain water to flow freely through the downspouts to the drain lines below. We offer this as a standard on every gutter cleaning package because we pride ourselves on a thorough job. It’s the little touches like this that separate us from the pack. New Westminster Gutter Cleaning can be carried out at any time of the year. However, the majority of our clients are on a twice a year, Spring and Fall, program.